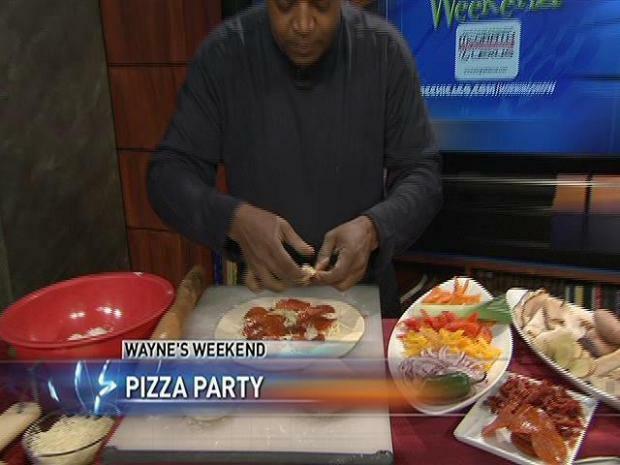 Wayne shows you how to make the perfect dough, put out a ton of ingredients and have your guests build their own pizzas. An easy and fun way to entertain is to get your guests involved in the preparation. With a pizza party, everyone builds their own and all you have to do is make the dough and put out an assortment of toppings. Below are a few tips, my basic pizza dough recipe and a list of toppings that may help you decide what to include for your party. You can also encourage your guests to bring a few unusual toppings to the party as well. Two really important pieces of equipment that you should have in your kitchen are a baking stone and a pizza peel. The stone will help make your pizza nice and crispy, and the peel will help you get the pizzas in and out of the oven easily. Wayne shows you how to get your guests to cook up some fun. In a medium bowl, dissolve yeast in 1/4 cup of lukewarm water. Add 2 tablespoons of olive oil and 2 tablespoons of flour. Stir to combine. Let mixture stand for 15 minutes while yeast activates. In a large bowl, combine remaining flour and salt. Pour yeast mixture on top and add remaining water. Combine ingredients to form a dough. Remove dough from bowl and knead it on a surface dusted with additional flour for about 8 to 10 minutes. Add in more flour if dough is too sticky. Pour 1 tablespoon of oil into a large non-metallic bowl. Rub dough in oil on all sides and then cover the bowl with a cloth. Let dough rise for about 1-1/2 hours until it has doubled in size. Preheat a pizza stone in the oven at 500 degrees for 30 minutes. Divide dough into four equal portions. Roll out each portion to form a crust about 10-inch in diameter. 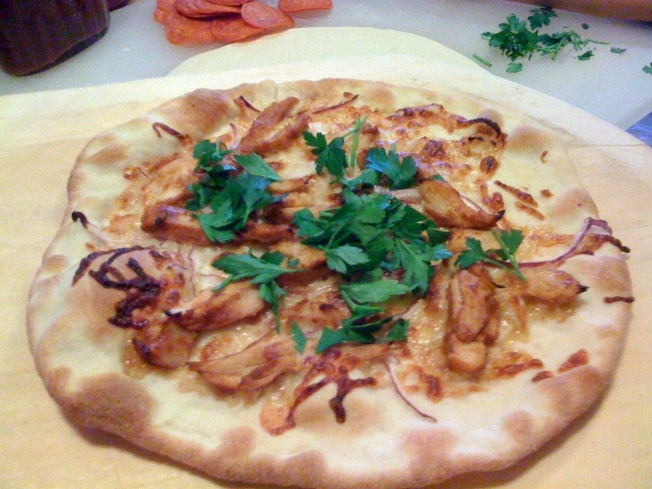 Place crust on a pizza peel that's been dusted with flour so that the pizza will slide onto the pizza stone easily. Cover dough with your choice of toppings, but don’t overload it. One of my favorite pizzas, the margherita, starts with only 1/2 cup of mozzarella, a few slices of fresh tomato and fresh basil. It may not seem like a lot of ingredients, but it makes a great pizza! Place the pizza on the baking stone. Bake it for about 8 to 10 minutes or until the crust has puffed up and is golden brown. Remove the pizza from the oven and sprinkle a little olive oil and freshly grated Parmigiano-Reggiano cheese on top. If you'd like to use a tomato sacue wtih your pizza, a simple option is to take a 14.5 ounce can of diced tomatoes, which is flavored with basil, garlic and oregano, and puree it along with 2 tablespoons of tomato paste. Spread it thinly on your pizza dough because a little of this goes a long way too. A variation on this idea is to have a pasta party. With this idea, encourage your guests to each bring a homemade pasta sauce. You make the pasta and provide some freshly grated cheese and parsley for toppings, and then everyone can sample the different sauces that have been made. You can even make a competition out of it and vote on your favorite sauce. Whether you have a pizza or pasta party, getting you friends involved in the cooking process will make it a flavorful and fun time for everyone. Thanks, once again, for all the ideas and suggests from my Facebook friends. If you have any questions or comments, please send me an email at wayne@waynesweekend.com or join me on Facebook, too.